We have returned from the business trip to London/Derby and a four-day layover in Iceland, but Mark returned with a torn retina – not an accident, merely a side-effect of aging. The retina was repaired this morning and all is well… although we must stay at the Penrose house. Mark’s repair and the gas bubble between the iris and his spot-welded retina cannot take the elevation gain of driving up to Westcliffe. Meanwhile, I have fallen behind in my blogs, three of which are on the back burner. I’ll begin with a few words on Sir Antony Gormley, one of my favorite sculptors. 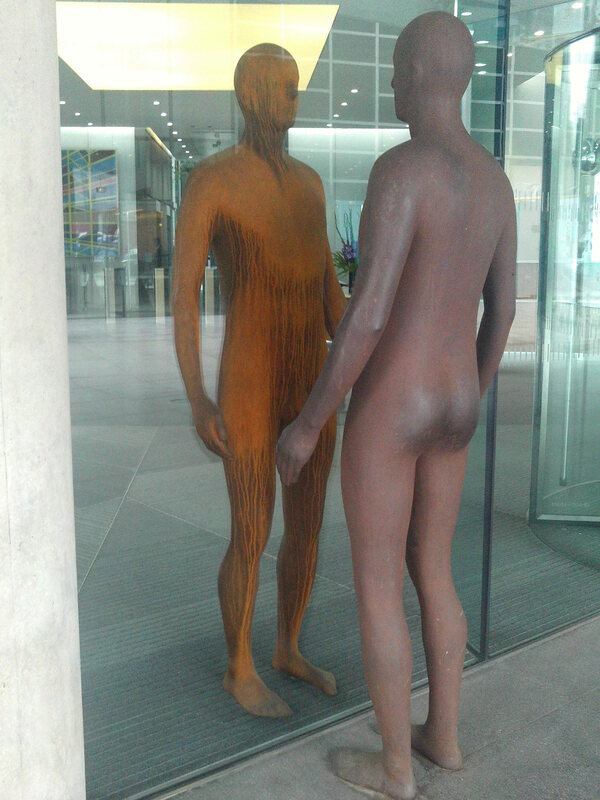 If you see a life-size, cast-iron sculpture of a naked man, you are probably looking at Gormley’s body. Most of his work makes you question man’s relationship to the environment. I took two photos. The first is self-explanatory. I prefer the second photo in which the reflective glass distorts the bodies. My spin on the second photo is that man is amorphous. We aren’t as solid or as important as we think we are. Man is a mere wrinkle in time. There’s a Thomas Carlye quote that says it better than I: ONE LIFE – A LITTLE GLEAM OF TIME BETWEEN TWO ETERNITIES. I love that. 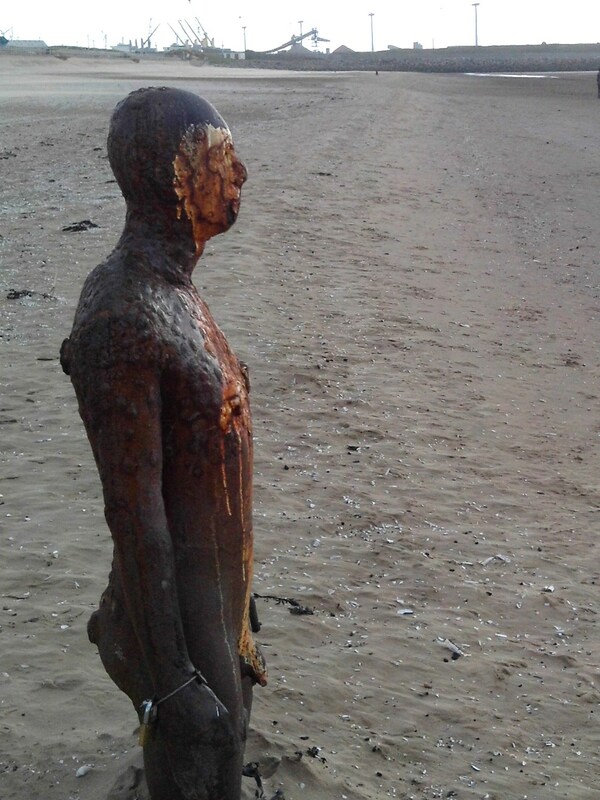 Being well acquainted with these first two sculptures, I have always wanted to see “Another Place,” a Gromley installation at Crosby Beach north of Liverpool. I had read that Gormley had installed 100 sculptures (yes, his body yet again) for five miles along the foreshore, and I had always wanted to see them. So while Mark was conferencing in Derby, I took the train to Liverpool and beyond. Unfortunately, I had neglected to check the tide table. Ideally I would have walked the beach at high tide to see some of the sculptures underwater or drowning. I wanted to see a graphic illustration of one of my favorite proverbs: TIME AND TIDES WAIT FOR NO MAN. No matter – for lack of water… sand. Unfortunately the tide was out and all the sculptures were dry… however, luck was with me. A gale-like wind off the North Atlantic was fierce and needles of sand acupunctured my face. Some of the sculptures were ankle deep in sand; other sculptures were knee or thigh-deep. Metaphorically, the installation worked well as well with sand as it does with the tides. 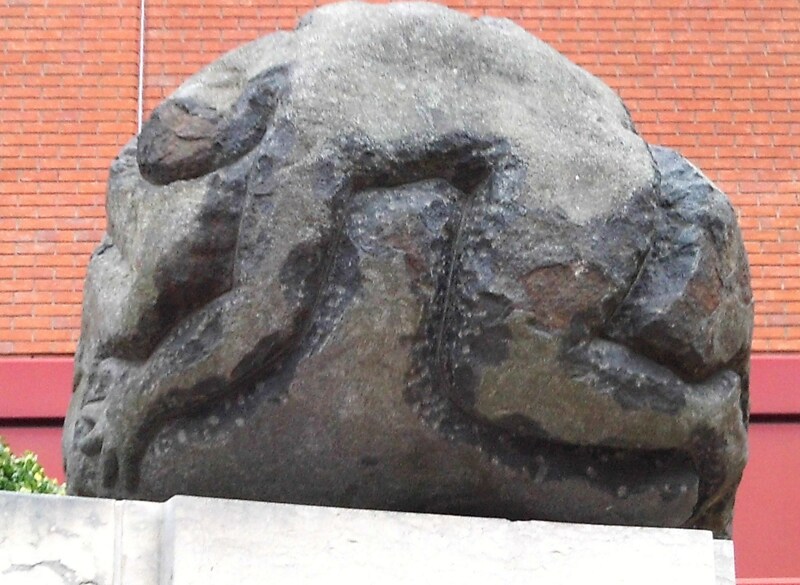 Speaking of “Another Place,” Gromley said: This sculpture exposes to light and time the nakedness of a peculiar body – it is no hero – no ideal – just the industrially reproduced body of a middle aged man trying to remain standing. Meeting girl friends at the British Library, I had another surprise. Gormley had a new installation in the courtyard. 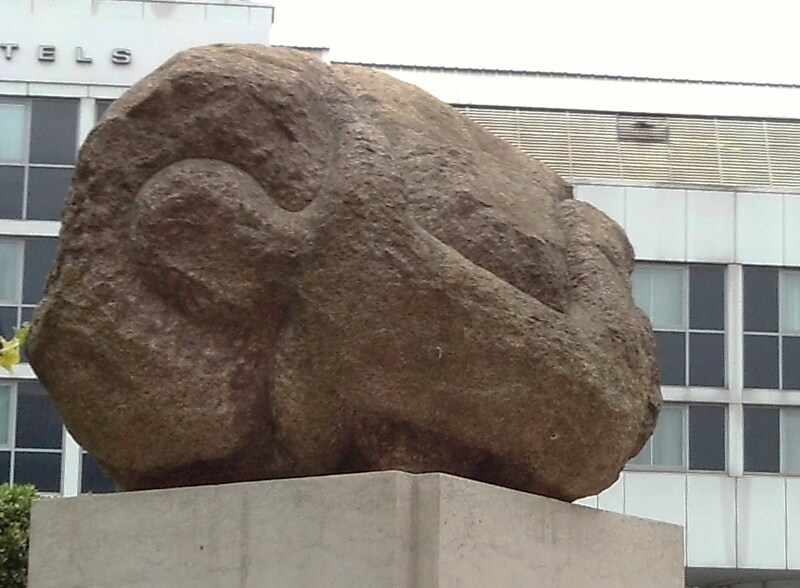 “Planets” consisted of boulders on top of numerous plinths. A man clung to each of the boulders. One clutched the top of the boulder and rode it like a horse. Another was slipping from the boulder and about to be crushed by it. On one boulder you could only see the tenacious, desperate hand. In closing, I just want to add one more photo. We returned from Reykjavik to DIA via Seattle. (Don’t ask!) 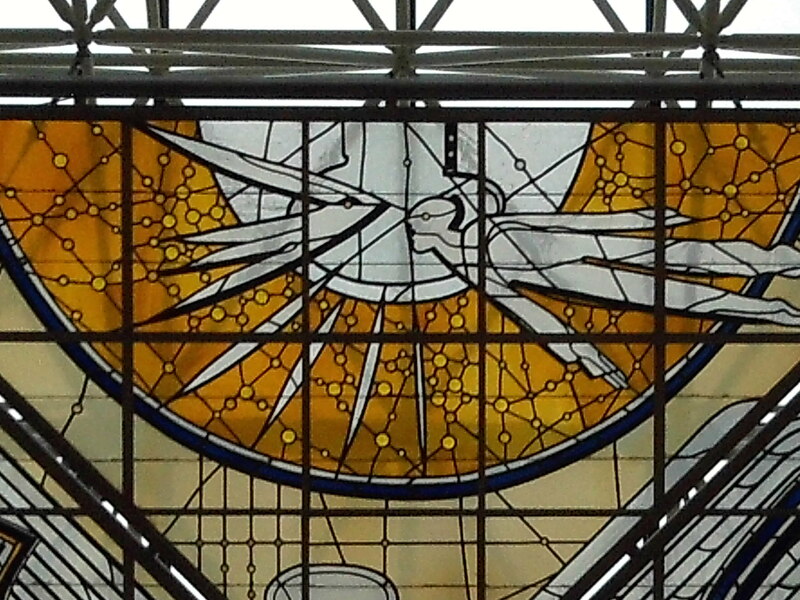 The Seattle airport is seriously cool, but in particular… in keeping with Time and Tides Wait for No Man… I love this Art Deco styled, stained glass. Man (Super Man) trying to fly faster than the ticking clock. Very Cool. Stay tuned. My next blog will feature Iceland’s killing of the goose that laid the golden egg. Welcome home! Nice. So sorry about Mark. Glad the surgery went well. Let us know if you need anything. You are a rock, Brent. How long do you have to stay in Penrose? Hopefully Mark will be able to come up the hill soon!